This article considers the technologies and topologies of MV drives, their advantages, disadvantages, and their impact on the quality of energy on the mains and motor sides. Part 1 of this article explores the line-side topology of MV industrial VSDs (see Vector, October 2018, page 32). On an MV drive with a motor-side filter capacitor, the capacitor forms an LC resonant circuit with the motor inductances. The resonant mode of the LC circuit may be excited by the harmonic voltages or currents produced by the inverter. Although motor winding resistances may provide some damping, this problem should be addressed at the design stage of the drive. Torsional vibrations may occur in the MV drive due to the large inertias of the motor and its mechanical load. The drive system may vary from a simple two-inertia system consisting of only the motor and the load inertias to very complex systems such as steel rolling-mill drives with more than 20 inertias. Torsional vibrations may be excited when the natural frequency of the mechanical system coincides with the frequency of torque pulsations caused by distorted motor currents. Excessive torsional vibration can result in broken shafts and couplings, and also cause damage to other mechanical components in the system. Device switching loss accounts for a significant amount of the total power loss in the MV drive. Switching loss minimisation can lead to a reduction in the operating cost when the drive is commissioned. The physical size and manufacturing cost of the drive can also be reduced due to the reduced cooling requirements for the switching devices. The other reason for limiting the switching frequency is related to the device thermal resistance that may prevent efficient heat transfer from the device to its heatsink. In practice, the device switching frequency is normally around 200 Hz for GTOs and 500 Hz for IGBTs and SGCTs. The reduction in switching frequency generally causes an increase in harmonic distortion of the line-side and motor-side waveforms of the drive. Fig. 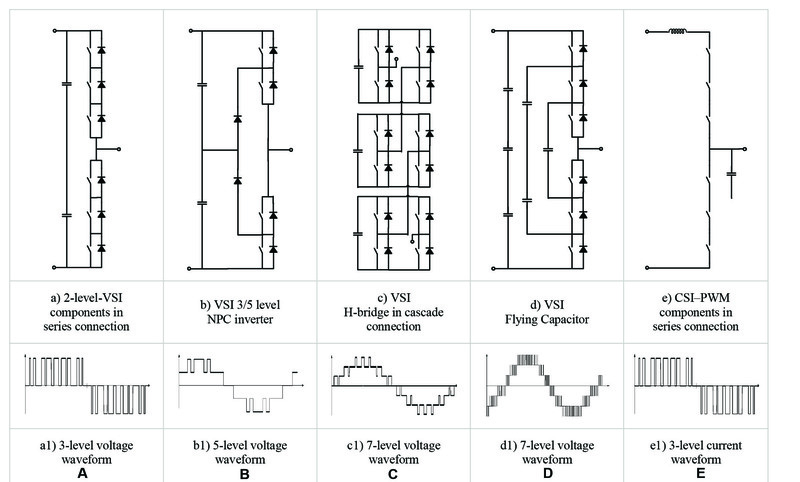 4: MV industrial VSI and CSI topologies (per-phase diagrams) and output waveforms. A variety of inverter topologies can be adopted for the MV drive to meet the motor-side challenges. Fig. 4 summarises the main industrial MV topologies and their characteristics. VSI inverter topologies normally use IGBTs or IGCT as switching device while CSIs use SGCTs or thyristors. These different arrangements and combinations of the switching devices define the topology of the inverter bridge. The challenge is to bring the best waveform to the motor with a reduced number of components, guarantying reliability and efficiency. Fig. 4a shows a topology known as 2-level VSI with components in series connection aiming to meet the adequate voltage balancing for each component. Due to the inherent characteristics of the components, voltage equalisation must be guaranteed with special gate drivers and passive voltage equalisation techniques. The drawbacks of this topology are associated with reliability because the higher number of electronic components used by the gate drivers, and with the efficiency because the passive components used for voltage equalisation are power resistors and have energy losses. The 2-level VSI inverter is a simple converter topology and has an easy PWM scheme. However, the inverter produces high dv/dt and THD in its output voltage and therefore often requires a large LC filter installed at its output terminals. Fig. 4a1 shows its typical voltage waveform. With a 2-level inverter topology, the motor voltage has three level steps. Fig. 4b shows a neutral point clamped (NPC) multilevel topology. It employs clamping diodes and cascaded DC capacitors connected to the floating neutral point. It produces AC voltage waveforms with multiple levels as shown in Fig. 4b1. The inverter can be configured as three, four or five-level topology. The higher the level steps, the higher the number of switching devices. The NPC inverter shown in Fig. 4b produces three level voltages between each phase to neutral point and five level voltages between phase to phase at motor terminals. This topology is suitable for motors rated up to 4,16 kV with standard 6,5 kV semiconductors. It is possible to increase the voltage to 6,9 kV, connecting two NPC legs in an H-bridge form. In this configuration, the phase to neutral voltage contains five voltage levels and nine levels at motor terminals. The main features of the NPC inverter include reduced dv/dt and THD in its AC output voltages in comparison to the 2-level VSI topology. This inverter can be used in MV drives to reach a certain voltage level without switching devices in series connection. The efficiency levels can therefore reach 99%. The switching frequency should be as low as possible due to the power losses and it is usually limited to a few hundred hertz. Normally, special modulation techniques are needed to produce the minimum harmonic distortion in the motor current in all ranges of speed and torque. Fig. 4c shows a 7-level VSI H-bridge in cascade connection. It is composed of multiple units of single-phase H-bridge power cells. The H-bridge cells are normally connected in cascade on their AC side to achieve MV level and low harmonic distortion, as shown in Fig. 4c1. The number of power cells is determined by its operating voltage. Some industrial MV drives use this topology implemented with LV semiconductors and electrolytic capacitors. rectifier, 3/5 level NPC inverter, 1,8 MW/4,16 kV. In this case, because of low reliability, redundant power cells should be installed. In case of failure, the faulty power cells can be bypassed and the drive can resume operation at reduced capacity with the remaining cells. The repair work must be fast once the bypass of defective cells may cause three-phase unbalanced operation for the motor. 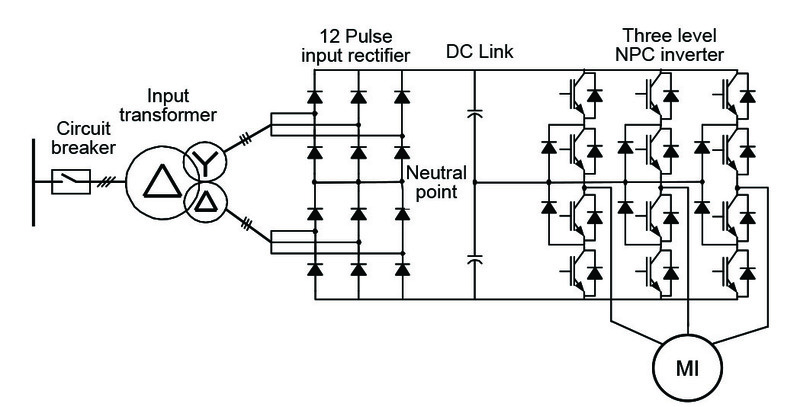 The power cells require isolated DC supplies that are obtained from a multipulse diode rectifier employing a phase shifting transformer which is normally complex and expensive. In most cases, this transformer should be installed close to the drive and the losses of this transformer will go into the electrical room which needs extra air conditioning. Figs. 4d and 4d1 show a typical configuration of a 7-level flying capacitor inverter and its waveform. It is also a VSI topology which produces the voltage waveforms with reduced dv/dt and THD. However, this topology has the drawback of the large number of DC capacitors with separate pre-charge circuits and the complex capacitor voltage balancing control. The DC capacitor voltages in the inverter vary with the operating conditions. To avoid the problems caused by the DC voltage deviation, the voltages on the flying capacitors should be controlled. This impacts the complexity of the modulation and control technique. The voltage source inverter produces a defined 3-phase PWM voltage waveform for the load while the current source inverter (CSI) outputs a defined PWM current waveform. The current source inverter features simple converter topology with motor-friendly waveforms. There are two types of current source inverter used in the MV drive: PWM inverters and the load-commutated inverter (LCI). The PWM inverter uses switching devices with self-extinguishable capability like SGCTs. The load-commutated inverter employs SCR thyristors whose commutation is assisted by the load with a leading power factor. The LCI topology is particularly suitable for very large synchronous motor drives with a power rating up to 100 MW. The PWM current waveform supplied by the inverter (see Fig. 4e1) is filtered by the capacitors installed at the inverter output, as shown in figure 4e, and the load current and voltage waveforms are close to sinusoidal. Thus, the high dv/dt problem associated with the VSI does not exist in the CSI. This topology uses an inductor in the DC link instead of capacitors, therefore the output current cannot be changed instantaneously during transients. This reduces the system dynamic performance. The CSI needs an adjustable DC current which is normally provided by a SCR rectifier making the input power factor dependant of the motor current. Another possibility is the use of a PWM current source rectifier which enables the regenerative operation. However, it also needs an input capacitor filter that may cause LC resonances and affect the input power factor of the rectifier as well. The inverter topologies presented in this section are deeply studied in . The user should consider the advantages and disadvantages of each topology, depending on the application, motor requirements and system efficiency. The performance of a 3/5-level neutral point clamped (3/5 level NPC) inverter was tested with a 4-pole, 1,8 MW, 4,16 kV MV motor coupled with a dynamometer. Fig. 6 shows the measured phase to inverter neutral point voltages and the phase to phase voltage applied to the motor terminals. The drive operated in the volts/Hertz mode control  and the motor was under rated load. Despite the small number of pulses, which means low switching frequency, the motor current is almost sinusoidal due to the optimal pulse pattern strategy. Some specific applications require high dynamic performance and closed loop vector sensorless or closed loop vector with encoder control strategies are necessary . The 3/5 level NPC inverter can provide this performance. The system formed by the 1,8 MW motor coupled to the dynamometer was accelerated from zero to 1800 rpm in four seconds, with an instantaneous torque response. output voltage (a) and motor current (b). Another challenge is the load step behaviour required when the motor is running at a fixed speed and there is an instantaneous variation of the load. This high performance behaviour is possible if there are no filters between the drive and the motor, meaning that short motor cable lengths and motors able to operate with variable speed drives. A sine filter is recommended for applications where the cable length between the VSD and the motor is higher than 500 m or the motor is unable to operate with a PWM voltage waveform and good dynamic performance is not required. Bin Wu: “High-power converters and AC drives”, IEEE Press, USA, 2006. Derek A Paice: “Power electronic converter harmonics – multipulse methods for clean power”, IEEE Press, USA, 1996. Joable Alves and P Torri: “IEEE Std 519 recommended practices for applications with variable frequency drives”, In: 9º Congresso Brasileiro de Eletrônica de Potência (COBEP 2007), Blumenau/Brazil, 2007. IEEE: “IEEE recommended practices and requirements for harmonic control in electrical power systems” IEEE 519, IEEE Press, USA, 1993. Joable Alves and Edson Hornburg: “High and low order harmonics for frequency inverters” (portuguese), in: VI Conferência Internacional de Aplicações Industriais (Induscon 2004), Joinville/Brazil, 2004. G Cunha and P Torri: “Neutral point potential balancing algorithm at high modulation index for three-level medium voltage inverter”, In: 9º Congresso Brasileiro de Eletrônica de Potência (COBEP 2007), Blumenau/Brazil, 2007. “MVW01 medium voltage frequency inverter manual”, WEG Automation, Brazil, 2009.